Ian Boardman, Queensland Public Advocate: Doing Advocacy: Dissent, Dissonance or Dilly-Dally? Doing Advocacy: Dissent, Dissonance or Dilly-Dally? 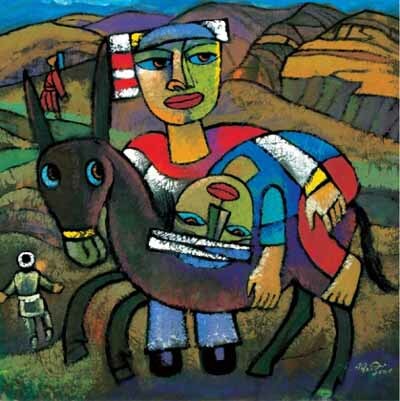 Image: 'The Good Samaritan' by Chinese artist He Qi as found at the Aussie in the Orient Blog. I thank you for the opportunity to speak with you today. When Noel Preston and I were discussing how we should link our two speeches, we agreed that Noel would focus on the question "why advocacy?" and that I would seek to create a bridge from that to the more practical question of "how to do advocacy?" In considering what this bridge might look like, and what intellectual traffic it will need to bear if my contribution is to be useful, I thought that I should begin with some higher order considerations, without which it may be difficult to appreciate the legitimacy of advocacy and how it is best applied in the real world. I say this because advocacy has been under fairly sustained attack in recent years and because even when it is not under attack, it is rarely appreciated by those to whom the advocacy is addressed - most usually governments and service providers. I also thought that I should discuss some of the pitfalls of advocacy, for the field is littered with them. I have fallen into some pretty deep pits myself over the years, including in recent times, so my humiliation is fresh enough to bring some spice to what I have to say. Before moving into the discourse I have outlined however, I should explain perhaps a little about who I am and what I do. I was appointed as Queensland's first Public Advocate almost four years ago. It is a prestigious position in that it is a Governor-in-Council appointment that is independent of any Minister or bureaucrat. In other words I am an independent public watchdog who reports on an annual basis to the Queensland Parliament. The Attorney-General must table my report in the Parliament within 14 sitting days of receiving it and has no power to alter it. I report about the state of things as they affect the lives of adult Queenslanders who have a decision-making disability. This includes four major cohorts - people who live with an intellectual disability or a mental illness or an acquired brain injury or any of the dementias. My job is to advocate systemically on their behalf. Now what does all this mean? What is the difference in any case, between advocating for an individual and this so-called systemic advocacy? This was one of the key questions that I first confronted when I took up my current job. It was such an important question that I begged, borrowed and made up definitions upon which my Office relies in its work. While the definitions are shaped specifically to my statutory responsibilities, I would suggest that they have general applicability. I would like to briefly share them with you. Advocacy can be understood as speaking, acting or writing, with minimal conflict of interest, to promote and protect the best interests and well being of adults with a disability. Systems are values, community standards and attitudes, power relationships and political systems, laws and legislation, policies, programs and structures, resource allocations and services that affect the well being of people with a disability. Systems Advocacy is advocacy on behalf of groups or classes of people with a disability, rather than individuals. Its purpose is to influence changes in the values, beliefs, attitudes, policies, procedures, practices, funding arrangements, legislation and 'cultures' that affect people with a disability so as to better promote and protect their rights, interests and well-being. I suppose there is an obvious common sense explanation as to why governments might decide that they need to create a public watchdog to defend vulnerable groups of citizens who cannot speak for themselves. That common sense explanation supports but does not fully capture what is a larger question about how we govern ourselves. I have argued since taking up my position that democracy is the greatest single systemic protection that vulnerable citizens have available to them. It should not be a controversial claim, yet for many thoughtful people it is. They observe the history of Indigenous dispossession in Australia, they recall our previously overtly racist immigration policies and are aware of the incarceration, as I speak, of young refugee children and their parents in containment camps in the Australian desert; they remember the young men who had no right to vote and were conscripted nonetheless to fight in an undeclared war in Vietnam; they think of members of religious orders perpetrating abuse against kids, of corrupt governments with their gerrymanders and their nepotism, of the thousands who have lived out circumscribed lives in institutions for the disabled dotted around the State - they remember all of these things and much more as well, and they wonder that anyone could claim that democracy is capable of protecting anyone except the powerful and the privileged. Yet this is my position, and it is important that we explore it today because if I am right, it goes directly to the question of what is effective advocacy and how it can be implemented. Winston Churchill once famously observed that democracy is the "least worst" form of government. What I think he meant, is that all of the injustices I have just described might well occur in a democracy - albeit a poorly functioning one - but these and even worse atrocities are more likely to occur under any alternative form of governance we can imagine or that has ever actually been tried. Now the particular form of democracy that we practise in Australia is called "representative government". The architecture of representative government in Australia is familiar to most of us; mainstream political parties submit candidates and policies to the electorate every few years, and are voted in or out on the basis, more or less, of "one person, one vote". The separation of powers is fundamental to this model. The separation of powers means that people in one of the three arms of government - the parliament, the executive and the judiciary should not control the other two arms. In most other jurisdictions in Australia we also have a "house of review", which is able to refuse or slow down the passage of government legislation. At the Commonwealth level of course, our "house of review" is the Senate. Finally, a well functioning system of representative government recognises the single most frightening weakness in the democratic process. This was first named by the French political and social observer De Tocqueville as he surveyed a burgeoning American democracy in the early nineteenth century. De Tocqueville coined the term "the tyranny of the majority" to describe this very significant weakness, and by it he meant that an unmodified democratic process is going to result in winners and losers, and the minority losers are at risk of being treated in very unfair, tyrannical and brutal ways. Hence the need for watchdogs - to protect the minority against the majority. There is a second weakness inherent in representative government, to which I shall refer shortly, but in the meantime let's examine how things have worked in Queensland? Until recently, we would have to acknowledge that representative government in Queensland has been pretty much a failure, at least insofar as it effectively protected minority groups. One has only to observe the widespread institutionalisation of people who were living with a decisionmaking disability to appreciate this point. The important question is, how did this failure come about? For almost half a century Queensland's democratic institutions were very weak. We lost our "house of review" because a Labor government many years ago was able to convince Queenslanders that we needed less politicians. We lost representative government when the principle of "one person, one vote" was lost to a Labor inspired gerrymander, which means that the vote of people in some electorates came to be worth the same as the vote of three people in other electorates. Then we had the unmitigated disaster of Bjelke-Peterson, who understood power well enough and countenanced an unparalleled corruption of our political institutions, but who did not understand that this corrupting process was a significant defeat for democracy and that it would constitute an appalling legacy for the State he loved, a legacy to which his name will always be attached. In June of this year, in his last column for the Courier-Mail newspaper before moving to The Australian, Tony Koch wrote a piece entitled "Faith restored after decades of disenchantment". Koch paid homage to a range of people over the past twenty years who have slowly helped Queensland to come back to her senses. In referring to the Fitzgerald enquiry, Koch had this to say: "It is my view that it took the Fitzgerald enquiry to make us all look at where we really were, and what sort of place we wanted to live in, and to leave our children". Koch went on to say that young people today, contrary to those living in Queensland 20-30 years ago, have every reason to have faith in Queensland institutions. On the same day that Tony Koch wrote his article, in the same newspaper, another journalist, Sean Parnell, noted that "(Premier Peter) Beattie has, at various times, raised concerns (about) Queensland's public sector watchdogs, ranging from a hypothetical questioning of whether they provide value for money, to a targeted attack on (one particular watchdog)." This behaviour of the Premier is worrying because, in spite of what Koch says - that we have good reason to be confident of the integrity of Queensland's institutions (a view by the way, with which I more or less agree) - our democratic institutions are still highly vulnerable. This is because they have just emerged from decades of sustained attack, and collectively we need to maintain strong and independent watchdogs if we are ever to develop and maintain a fairer, more civilised and compassionate community life. Parnell went on to say that the Parliamentary Opposition, government backbenchers and members of the broader community should take considerable interest in what decisions the Premier makes when he comes to replace three and possibly more of these watchdogs in the current year. I would go further than Parnell however. We don't just need to ensure that we have strong and independent watchdogs. We also need to nurture a community-wide culture that encourages dissent and that welcomes criticism as the means of making things better. Do we have such a culture in Queensland? I would suggest not. On the contrary, when I first arrived in Brisbane some four years ago, to my mind the most striking characteristic of the broad socio-political culture was its unusually punitive nature. It did not matter where I ventured, people were afraid to speak out for fear of being punished. In organisations as venerable and mainstream as Queensland Health, the Endeavour Foundation and throughout the community services sector, people reported that they did not want to be identified because it was their experience over many years that, once identified, they were likely to be punished by those in positions of power. It seems that many people and organisations in Queensland experience considerable difficulty in communicating their concerns effectively to those who have it in their power to make things right. It might be someone who is attempting to use a service provider's complaints system to bring to the notice of authorities an obvious wrong, or someone who is unhappy about the Government's consultative processes or way of doing business, or someone who is attempting to advocate for another who they believe is being neglected or abused; as often as not these people have reported to me that they are ignored or stereotyped as troublemakers; to then be marginalised or threatened. This punitive culture extends to how we respond to cases of neglect and abuse when they do come to light. We all want the abuse to stop, and where the law has been broken we agree that the offender must face the consequences. But we go further. It seems that if we have not succeeded in shooting the messenger, then we are hell bent on finding someone to blame, as if by identifying and punishing one individual culprit, we have made everything right. But we have not made everything right. Too often an individual is forced to bear the blame for a poorly functioning system, a system that may even have encouraged the individual to think they were doing the right thing. What I am talking about here is the very flavour of democracy, which is one of openness to dissent; one of discourse that is capable simultaneously of being both conflictual and civilised. This punitive culture seems to permeate not just individual service providers, but the very relationship that exists between government and the community it is meant to serve. I have been told of community based organisations, when speaking out on issues that fall within their area of expertise, being threatened, and yes bullied by government and Ministerial representatives. No doubt I will be challenged to name names. But this is the problem. The people who report their experiences have required of me a promise that I shall not name them, for they are afraid. I can only refer you to those occasions that have been publicly reported over the past few years, and rely on any members of the press who are interested to pursue the issue, to search out others who are willing to come forward. It is important for all of us to understand just how vulnerable democracy is, ever susceptible to being crushed by those who find it too limiting for the scope of their ambitions. We do need to be eternally vigilant. I want now to move from the Queensland sphere to the Commonwealth, where things are no better, and in many ways worse. The record of the current Federal Government provides an ideal illustration of how the institutions of representative government can be so easily subverted and weakened by government itself. The argument I propose to put today, is that the Federal Government's actions over a considerable period of time have had the effect of driving political discourse in our country to a dangerous ideological extreme, where a long tradition of the "fair go" and support for the underdog has been replaced by a bias towards fear and suspicion of the "alien outsider". It does not seem to matter if that outsider is a refugee or an Indigenous Australian or a person with a decision-making disability; the reaction has become essentially the same - one of exclusion and hostility. Noel has already referred to the report from the Australia Institute, "Stifling Dissent", which examines the record of the current Federal Government in its relationship to the community sector of which UnitingCare is a part. The Report is based on a national survey of NGOs to which there were 290 responses. Its findings are both disheartening and disturbing. Drawing from a range of academic sources in addition to the survey results, the Report notes that "a well- functioning democracy is not limited to elections every three or four years but involves a continuing process of consultation between government and the citizenry". The Report goes on to discuss the essential role, and the legitimacy, of nongovernment organisations in "conveying important information about the needs and preferences of a wide range of groups in the community to governments that would otherwise remain remote and uninformed", and makes the point that "NGOs are ... an essential component of a healthy and robust democracy". The issue examined by the Report is the fact that, during the years of the Howard ascendency, "the legitimacy of NGOs and their contribution to democratic processes (including their right to advocate) has been under attack". I won't at this time go into the detail of the Reports findings, except to observe that this is an interesting development, because the Howard Government has appropriated the language of social advocacy - which argues that service providers cannot effectively advocate because they have an inherent conflict of interest - and has turned that language to its own purposes. This brings us to the second systemic weakness in representative democracy, one to which I made brief reference earlier and which the Report describes as "the democratic deficit". The Report argues that representative government both celebrates the original democratic ideal of 'rule by the people' and at the same time is hostile to it. All of the institutions of representative government - elections, political parties, representative assemblies, public service bureaucracies and so on - constitute a deficit because they exclude the people from the practical work of government. To its credit the current State Government has moved towards reducing that deficit by encouraging substantially greater community engagement. The question here is, will people who are afraid of being punished be prepared to engage? The Report then goes on to discuss the ways in which the Howard Government has eroded democratic institutions and policy-making processes. I will highlight just two. First, these new processes tend to favour "large over small organisations and, in some cases, for-profits over nonprofits. Even if they do not, they encourage nonprofits to imitate for-profits. Increasingly, governments seek to use contracts to prevent the practice of public-serving nonprofits advocating on behalf of those groups to whom they provide services. Second, the Report observes that, "as a result of this shift many disadvantaged groups that had taken years to organise themselves sufficiently to have a voice have found themselves increasingly excluded from the policy-making process." I have quoted extensively from "Stifling Dissent" not only because I would want to encourage UnitingCare and other NGOs to stay true to their own mission and to speak out fearlessly on public policy issues, but because I want to challenge the managers of those same organisations to consider whether they might sometimes be guilty of doing the same thing that the Howard Government has done over the past eight years, not only in dealings with external advocates but towards their own frontline staff. I should at this point acknowledge that UnitingCare, in its dealings so far with my Office, has demonstrated commendable openness and indeed grace, in circumstances where a more robustly assertive stance might have been considered reasonable. This has happened I would suggest, because there are sufficient individuals within the leadership group of UnitingCare who understand the importance of independent advocacy, as a systemic protection for marginalised people, and who are prepared to support the place of advocacy even when there is the perception that the advocate may have got it wrong. Having said that, UnitingCare is a very large organisation with complex governance arrangements and many people working for it. This means that UnitingCare is as susceptible as any organisation to the deficits that give rise to the need for independent advocacy. As I have discovered in my own work, neither a well developed mission statement and corporate vision, nor sound operational principles, nor a desire and willingness to act ethically and compassionately, can protect us from instances of individual or corporate negligence or abuse. It is not because we are evil that this is the case, but simply that we are perfectly human beings, which means of course that imperfection is builtin, both to our individual character and to the systems that collectively we devise. This is why it is extraordinarily important that every one of us appreciates the legitimacy of advocacy, be we representing our organisation to government or representing the interests of a vulnerable individual client who is suffering because our fellow workers, or perhaps our supervisor or manager, has failed to afford them protection. If there is one single message that I would like you to remember from what I am saying, it is this. Don't let anyone convince you that you have no right to speak out on behalf of individuals or groups who are at risk of abuse or neglect. And don't ever try to convince someone else that they do not have this right. If we can clearly see that something is wrong and a moral offence, then we have a right, and many would say a duty, to speak out. Similarly a frontline worker has a right to speak out when they see a colleague or their boss doing the wrong thing. The question here is, will the system support them to do it? There are examples from Queensland in even the past few days when workers have spoken up bravely only to be ostracised and threatened. So although advocacy is legitimate morally, ethically, spiritually and politically - regardless of what any government might say to the contrary - it also typically comes at a cost to the advocate. In a world driven by self-interest and a fear-based consciousness, it cannot be otherwise. This raises some very practical questions for both direct support workers and for managers, questions to which I do not necessarily have the answers but which I would like to spend a little time exploring. What makes for effective advocacy? How can we be vigilant in the defence of vulnerable clients when our own interests and those of our family are likely to be at risk? How can we be vigilant as an organisation when our major funding provider is known to be ruthlessly punitive of any public comment that is perceived to be negative? A parliamentary outburst that occurred not so long ago here in Queensland, with respect to a housing report published by the Queensland Council of Social Services, springs to mind. The same parliamentarian who made the outburst - he essentially threatened QCOSS with a loss of funding - has acquired a reputation among community organisations for brooking no dissent in his portfolio area. This is a sad thing, because he is said to be otherwise decent, and committed to helping disadvantaged people. This goes to the nub of effective and open management. We as managers have to be very clear about what it is we are trying to do. What is my organisation for? What is its mission? What are the values of the organisation and are my personal values consistent with them? What if they are not? What should be my attitude to external advocates who I know are going to make life difficult for me? What happens when the advocate is one of my own staff? Part of the difficulty in service provider organisations is that conflicts of interest do exist. We can argue as much as we like that every person has a right to advocate, at least to their next level of management; we can set in place robust and ethical grievance and complaint mechanisms; but having done that, there still remains the very real risk that the needs of the organisation will win out over the needs of individual clients. If we turn our minds briefly to the ongoing exposure of sexual abuse within facilities managed by different churches, we see time and again that the corporate need of the church to defend its reputation and its assets results in the matter being handed over to lawyers who are paid to do just that; with notions of compassion, truth, justice and witness getting lost in the process. It makes sense then that if a church wants to establish an advocacy capacity, to conduct social justice advocacy for instance, then that function should be both properly resourced and located as a highly independent agency outside the organisational structures of the church's service delivery arm. Now Noel has asked me to speak to some of the elements or principles of practical advocacy. There is a wealth of written material about advocacy principles and how they might be applied; and I commend these writings to you. However, my greater interest, in the few minutes I have remaining is to talk less to the principles of advocacy, and more to the state of mind that an advocate needs to nurture, if his or her advocacy is to cause no harm, and possibly even succeed. The advocate's anger at injustice will be carefully controlled. The advocate will recognise that the anger belongs to them, that it is their burden, to be used as a fuel for 'the fire within' perhaps, but never as an excuse to abuse in turn those against whom the anger is directed. The advocate will be clever. They will have studied the target of their advocacy and will know them well. They will know what is important to the target, what makes them tick, what it is that they want to achieve; and in knowing these things they will better know how to shape their proposals and their discourse. The advocate will be collaborative, because they will know that they are not the font of all wisdom. They will appreciate the benefit of unexpected alliances. They will also appreciate the constantly changing nature of the politics of life, the fact that an opponent today can be their ally tomorrow. They will acknowledge that in this sense the advocate is him/herself a political player, neither superior to others nor set apart from the rough and tumble of ordinary life. The advocate will be prepared to compromise, because they will know that people are more important than principles. And when the occasional situation arises when a principle must be defended for its own sake, they will advocate to win and will know that they could well lose. The advocate will have learnt humility, because they know they are one person at one point in time, living in a world of constant change and ongoing mystery. It is the most difficult thing to act powerfully and lovingly at the same time. Spiritual masters such as Christ do it with ease and with great effect. For ordinary mortals like us it's not so easy. Yet it was another spiritual master, Gautama the Buddha, who offered some hints on how we might go about it, when he elucidated the so-called eightfold path. Put very simplistically, this involves right mindfulness combining with right understanding and right intention, to lead to right speech and right action. A starting point for us perhaps, is to rightly understand what is at the heart of human service. The primary motivation for human service should not be the hope that social justice on earth will ever be achieved, or that our worldly actions will lead to heavenly reward, or indeed, that we are helping to create heaven on earth. Nor should we be swayed to the view that we are the 'good guys' fighting against evil, for this viewpoint in particular has its own deadly pitfalls. Of all tyrannies, a tyranny exercised for the good of its victims may be the most oppressive. It may be better to live under robber barons than under omnipotent moral busybodies. The robber baron's cruelty may sometimes sleep, his greed may at some point be satisfied; but those who torment us for our own good, will torment us without end, for they do so with the approval of their own conscience. No, what is really at the heart of all human service is essentially mystical; the opportunity and potential for profound transformation in our own lives and in the lives of those we serve. Having developed this right understanding, what personal qualities and human capacities might motivate us to right action? The qualities that I am about to list were developed by someone I greatly respect; someone who is atheist in her mind and Christian in her being. I find myself embarrassed when I read out this list, because they are such personal and somehow fuzzy qualities when contrasted to the often brutal circumstances in which advocates can find themselves working. Yet they accurately reflect what is most needed in this frightening and imperfect world. Let me read them to you. Love, kindness, warmth, conviction, persistence, inventiveness, inspiration, compassion, sensitivity, justness, empathy, humour and joy. To this list I would add courage. The nurturing of these qualities in ourselves is our greatest protection against professional 'burnout', a potent vaccine against spiritual pride, and a sound basis for effective advocacy. This is important work that we do in human services. At one level we are simply standing with and beside the marginalised and oppressed. At another level we carry with us in our work the transformative possibility, a possibility that sometimes has to be sufficient hope and purpose, in the face of the warmongers masquerading as our leaders and the mayhem they create. My essential argument here is that if we can get these inner settings more or less right, we will be more likely to know when advocacy is required, and we will know how to conduct that advocacy. I would like to end this speech by quoting from a man who is well known in Queensland disability circles - Michael Kendrick. I use this quote because it sums up for me the challenges of working in human services; and offers some wisdom about how we should respond to the inevitable difficulties. It applies whatever political situation obtains. "It is therefore important to not give up on change in the face of continuing opposition based on the belief that it is hopeless. It may well be that there is no reason for the kind of optimism assured by favourable probabilities, but this does not mean that one is having no effect. Often, we do shift the world one person at a time, and none of this will occur if we start with the premise that these small shifts are pointless because they do not quickly or inexorably lead to triumph. Perhaps if we saw our goal more as changing the world by degree and increments, rather than as winning, we could take more solace in the fruitfulness of what we do achieve, rather than lament the changes that have yet to succumb to our efforts. One never really knows when the tides will change in the hearts and minds of people, and it may well be that a crucial corner has been turned even when we least expect it. It may also be true that the personal commitments, of even one person, may be just enough to make the difference." I commend that "personal commitment" to you. I commend you for the work that you do. I hope that you have a better understanding of the potential for advocacy, and I thank you for listening.